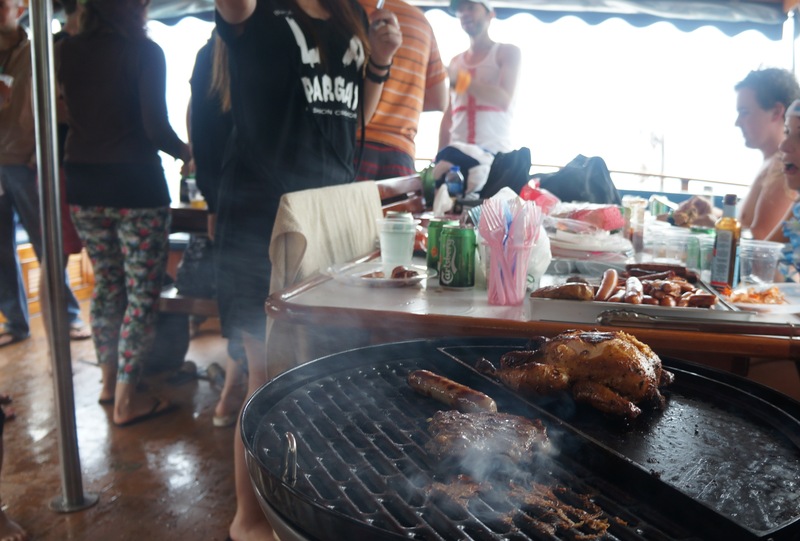 There are a few kinds of parties people have in HK–beach parties, dinner parties, karaoke parties, bar hopping, rooftop grilling parties and junk boats. Any public holiday: “who wants to do a junk! ?” Any summer weekend: “who wants to do a junk! ?” A junk boat is a yacht that has enough for a spacious party of 30 people–sun decks, ocean waters, island views, open bars, decent food. It’s easy to do, common, and awesome. But somehow I managed to make it 10 months in Hong Kong without going on a junk. Every time someone said, “Hey, want to go on a boat all day and hop between islands and have an open bar and bbq?” I said: “Aww, I think I have to work.” Or: “I already made plans! Next time?” or: “Yes!” and then the day of I felt sick. These events conspired to prevent me from having one of the most common Hong Kong experiences. We planned ahead. We decided we would do it on May 1 (HK Labor Day/public holiday) and put a downpayment on the boat early in April. It would be roughly 540 HKD (80USD) per person (this is the company we used). We were set. The only worry was the weather. All month it had been hit or miss. Mostly miss: rain and mist and smog. The best of Hong Kong. The day before we sailed it was raining. And the day we went it was raining, lightly. A mist really. But not all day. It was perfect even-no one got sunburned and it was cool, but still warm enough to jump in the ocean. 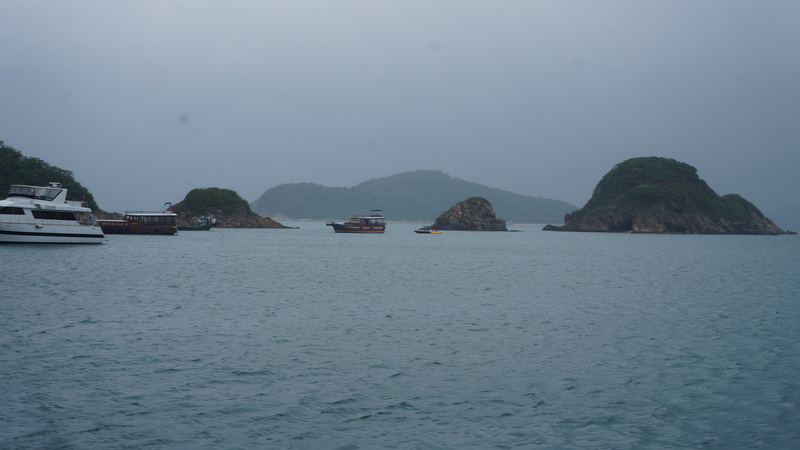 And we still had the beauty of south Hong Kong Island. Our boat had an open bar and a grill and bean bags on the roof and a speed boat from which we could wake board. Not bad. I personally took over the grilling, as it is my favorite thing. I think everyone brought a package of sausages except for yours truly. I brought king prawns and a chicken. Cause I’m cool like that. The only danger with grilling is when the boat rocks: have something to hold on to or you will fall into the heat. It is definitely an experience though. Probably the best way to eat on a junk (also the best way to eat ever). I did jump in the ocean a few times, the boat even provided pool noodles on which to float. It was slightly more exciting than usual swimming because of the jellyfish. We saw them every few minutes: big pale orbs floating beneath the surface. Minor freak out. No one got stung, though one person may have kicked a jelly in the head. We threw a frisbee anyway. And jumped from the top deck into the ocean. Good times. There were a few boats in the same bay as us, and they were mostly filled with parties of young teenagers and their parents. At first we asked ourselves why you would get a junk boat for kids when most of the price was the open bar–and then it hit us. A junk is a perfect party for parents. As long as you pay slight attention to make sure no one gets hurt, the parents can enjoy themselves by the food and Carlsberg, while the kids dare each other to go swimming in jelly infested waters. I’d never thought of it that way. Point of the story: I will do this as often as possible. The best thing about it was that we were hanging out with friends all day, and no one had anywhere else to be. We could really focus on just enjoying ourselves. Work and texting other people would have been pointless. It’s just you, your friends, and a yacht.